Play Milton | Pet Daycare| Redwood Pet Resort Ltd.
At Redwood Pet Resort in Milton, our comprehensive daycare program provides a safe environment for your pet to socialize, play and learn under the supervision of our staff. Using positive training techniques, we always encourage good behaviour throughout the day. We offer quality services at market value prices. Doggie daycare is $33.00 – $45.00 per pet per day. 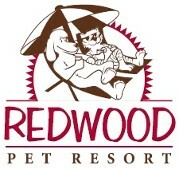 The price depends on the suite you choose for your pet. All prices include a choice of walk or playtime. Call today and ask about our multi-day discounts. The charge for birds and other small animals is $10 a day. You will need to bring all cages, supplies and food. Like humans, dogs need to socialize in order to combat restlessness, or as well call it, cabin fever! The key benefit to sending your dog to daycare is the physical and mental stimulation they’ll receive in our controlled environment. Also, there are links between proper dog socialization and reducing behaviour problems. Don’t leave your furry friend home alone, keep your dog happy and engaged at our doggie daycare. We understand some pets have special dietary requirements; that’s why we make homemade food for animals on raw food diets. Call us to organize your pet’s meal plan.